Rep. Mary Sullivan (D-Burlington), lead sponsor of a resolution calling for pension funds to divest fossil fuel stocks, addresses the House. 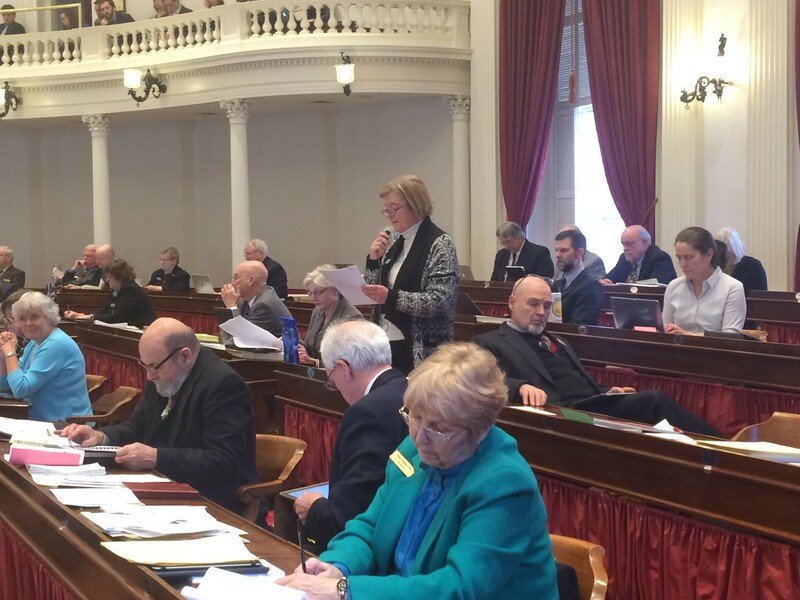 In a largely party-line vote, the House approved a resolution Friday urging the state treasurer and the Vermont Pension Investment Committee to take steps for the state’s pension funds to divest their coal and ExxonMobil stocks. The vote: 76-57. The resolution supports the call for divestment that Gov. Peter Shumlin made in his State of the State address in January. He appealed directly to the Vermont Pension Investment Committee earlier this week. Treasurer Beth Pearce has argued that decisions about how pension money is invested should be based on financial factors, not politics. But after Shumlin addressed the investment committee, she and VPIC agreed to look into possible divestment of coal and ExxonMobil stocks. The House resolution focused on both the climate change and financial arguments for divesting from fossil fuel assets. It noted, for example, that a growing number of coal companies are filing for bankruptcy. Republicans countered that the legislature shouldn’t be telling the state treasurer how to do her job. “We should trust our state treasurer and pension board to do their due diligence,” said Rep. Job Tate (R-Mendon). “I see the amendment as gutting the resolution,” said Rep. Jim McCullough (D-Williston). A majority of the House agreed, and Tate’s amendment failed, 79-54. Rep. Patti Komline (R-Dorset) suggested that if lawmakers wanted to start directing investment decisions, they also ought to look at companies with records of human rights violations. Her amendment called for the treasurer to provide the legislature with a list of these companies by next January. The House rejected the amendment on a voice vote. Rep. Oliver Olsen (I-Londonderry) offered an amendment for the state to demonstrate a visible commitment to reduced carbon emissions. He proposed converting the parking space on the east side of the Statehouse, which is reserved for the governor’s large sport utility vehicle, into a charging station for plug-in electric vehicles. Olsen said he has an electric car and has trouble finding a spot where he can recharge it. Rep. Mary Sullivan (D-Burlington), lead sponsor of the resolution, said Olsen had a valid point, but argued that the parking space request wasn’t relevant to the divestment question. The House rejected Olsen’s amendment on a voice vote. Sullivan said the resolution urging divestment was a compromise. Some lawmakers wanted a bill that would have mandated divestment. Austin Robert Davis, policy and communications coordinator for 350 Vermont, an organization that has pushed for divestment, welcomed the resolution even though it is non-binding. He called it an appropriate way for the legislature to weigh in. The resolution will be forwarded to the treasurer. It wasn’t a joint resolution, so it won’t go to the Senate. The Senate Government Operations Committee has taken testimony but not yet voted on a divestment bill.